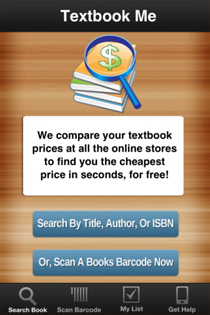 Textbook App - Scan A Barcode To Find The Cheapest Textbooks! 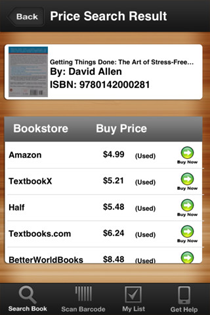 Now you can easily find the cheapest college textbooks right from any iPhone or Android mobile phone! 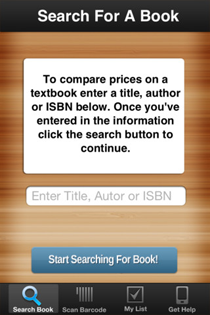 With the TextbookMe app you can make sure you're getting the best deal on your textbooks every semester. 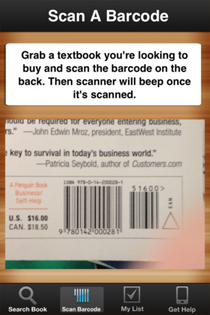 We have our own barcode scanner built right into the app so you can take it into any bookstore and scan you textbooks and see how much that book is online at all the online stores. Generally you'll find that the textbook can be found for a much lower price online. Once you've scanned in all your books you can head home and simply order your books online saving a bunch of cash. Most of our users have reported saving 30-50% on their books every semester. Best of all it's completely free, so you have no reason not to install this on your phone right now! Just grab your phone and hit the app store on your device, once there search for "TextbookMe" and you'll see our app come up. The only thing we ask is that you please leave us a review which will help other people find us! Also tell your friends, family, neighboors, not your friends, basically anyone about us so you can help them save some cash on their over priced college textbooks as well. Use the links below to learn more info about the app on each platform.